Feeding on fruits of Gossypium thurberi in Florida Canyon, Sta. Rita Mts., Arizona, USA. 26 July 2013. 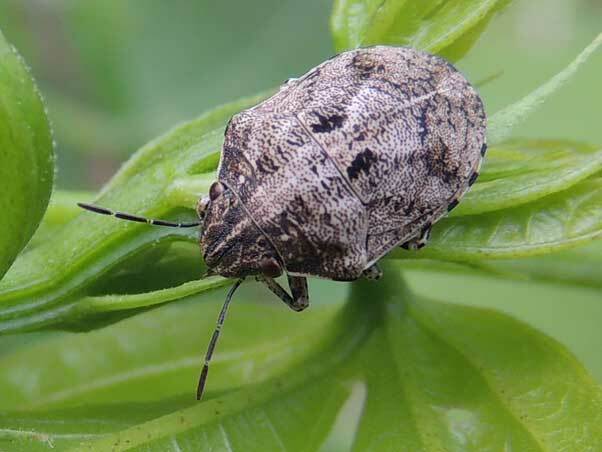 Shield bugs are plant-feeding insects. In most hemipteran bugs there is a small plate on the dorsum of the thorax called the scutellum; in shield-backed bugs this plate is enlarged and covers the entire abdomen. This makes the bug resemble a beetle. This plate can be lifted up exposing the flight wings. Shield-backed bugs can be distinguished from beetles because the shell has no midline seam as in beetle elytra. Further more the mothparts of beetles are of the chewing type, whereas shield- backed bugs have piercing sucking mouthparts - these resemble a beak.